It has been a long time coming, many of you have been waiting for this day and its finally here. Thanks some hard work over the christmas break the new Pipeline Tool is now working on both MacOS and Linux. The Linux installer/tar script is still being worked on but should be available in the near future. For MacOS users you can download the Pipeline Tool installer from the downloads page. You will need to have mono installed on your system for it to work, so if you do not have mono installed head over to go-mono.com and download the latest release (3.10). 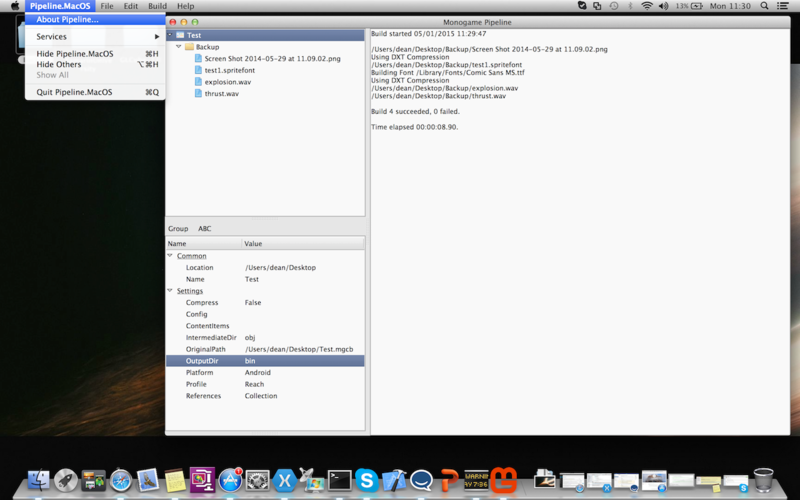 The Pipeline Tool will be installed as a normal Mac App in /Applications/Pipeline.app. The tool will behave exactly as the one on windows does. You can use it to create a .mgcb project and compile Textures, Fonts, Audio and 3D Models as well as use Custom Content Processors. There are a few things that current do not work on MacOS or Linux, the first is custom Effect compilation. At the time of writing the 2MGFX tool does not run on Mac or Linux because of a dependency on some DirectX tooling so for now if you want to use custom Effects you will need to compile those on Windows. For more information on the Pipeline tool and the underlying MGCB tool checkout the documentation. One common question surrounding MonoGame has always been the quality of the samples currently maintained in the various branches of the project. It has been an ambitious journey, with a lot of in depth discussions and debates, but now the first of the samples has just been accepted in to the new samples repo. The first sample is just a taste of what is to come and is born of the already tried and tested Platformer 2D sample from the age old XNA library. The sample serves as a guide for how to build and manage your game project in a fully multi-platform way with all the code in one place and shared across all projects. The new samples repo isn’t stopping there of course and we welcome anyone to submit new samples to the project so long as they meet the criteria mentioned earlier. Come one, come all and get involved! 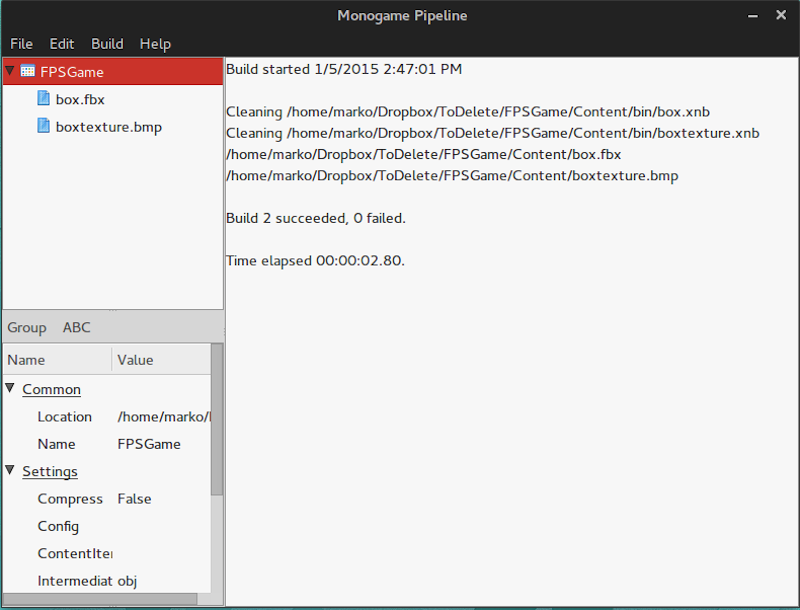 MonoGame 3.2 NuGet packages are GO! Just over a week ago the MonoGame released the latest full package for the MonoGame framework, now baselined at Version 3.2. This release brought numerous fixes, improvements and new features to the MonoGame platform and updated the Windows installer that had long needed some love. It took a while but I finally managed to find some spare few hours to get the MonoGame NuGet releases updated to the 3.2 release, with a few extra surprises. iOS / MacOS / Android templates coming soon. This contains the DLL update references for Content projects built using a MonoGame Content Builder Project. Updated again in line with the 3.2 release. Added some new support that was added with 3.2, including GamePads, keyboards and a few other tidbits. MonoGame Portable is still maintained by me separate to the main MonoGame repo, so any issues please direct them to me and the separate MonoGame.Portable fork. once the new way of generating the Portable package and it gets consumed by the main project, this too will join the official family. At present MonoGame doesn’t support Windows Phone 8.1 APP projects, this includes the new Universal App templates. Nearly managed to add support through the NuGet packages but there are just enough subtle differences still between Windows 8.1 and Windows Phone 8.1 that it will require code changes to handle. Although I suspect a PR will no doubt appear soon enough to resolve this. When MonoGame can support Windows Phone 8.1 App projects, the Nuget’s will get a refresh. This is the long awaited release of MonoGame 3.2 with over a year of fixes, features, and improvements across 1,600 commits. This release only has an installer for Windows as we are currently reworking our Mac and Linux release packaging. VS2013 support for MonoGame templates. Big improvement to XInput performance on Windows/Windows8. Support for WPF interop under DirectX. Enhancement to support multiple GameWindows on Windows under DirectX. Reduction of Effect runtime memory usage. Support for DXT/S3TC textures on Android. Touch support on Windows desktop games. Internal improvements to reduce garbage generation. Various windowing fixes for OpenTK on Linux, Mac, and Windows. Automatic support for content reloading on resume for Android. Support for TextureCube, Texture3D, and RenderTargetCube on DirectX. Added TitleContainer.SupportRetina enhancement for loading @2x content. Lots of Android/Kindle compatibility fixes. OpenGL now supports multiple render targets. Game.IsRunningSlowly working accurately to XNA. Various fixes and improvements to math types. DrawUserIndexedPrimitives now works with 32bit indicies. Various MonoGame FX improvements and fixes. Render target fixes for Windows Phone. MediaPlayer/MediaQueue/Song fixes on Windows Phone. XNA accuracy fixes to TitleContainer. Fixes to SpriteBatch performance and compatibility with XNA. Fixed disposal of OpenGL shader program cache. Improved support of PoT textures in OpenGL. Implemented missing EffectParameter SetValue/GetValue calls. Touch fixes to Windows Phone. Fixes to orientation support in iOS. Lots of PSM fixes which make it usable for 2D games. New Windows desktop platform using DirectX/XAudio. Old Windows project renamed WindowsGL. Fixed offsetInBytes parameter in IndexBuffer/VertexBuffer SetData. Fixed subpixel offset when viewport is changed in OpenGL. Tons of content pipeline improvements making it close to complete. Wanted to catch everyone up on some updates to MonoGame on GitHub. MonoGame has gotten a lot of new platforms and we foresee more on the way. It has become a challenge to manage so may projects and keep them in sync to each other. This causes frequent build errors from missing files, wrong files being included for some platforms, missing features caused by missing files, etc. To alleviate this a few weeks ago we started the migration to Protobuild. Protobuild is a simple tool which generates Visual Studio projects and solutions from a common definition file. It is a single small 106K EXE that is fully cross-platform running on Windows, Mac, and Linux desktops and some configuration files to drive the process. So far things have been great with it and the effort to make changes to the projects is largely automated. We plan to move more of the projects over to Protobuild in the coming weeks. I encourage you to learn more about Protobuild on its wiki and consider if it is a good solution for your own projects. For a long time the binary dependencies for MonoGame have been in the ThirdParty/Libs folder which redirected to kungfubanana/MonoGame-Dependencies. This was fine for a long time, but the owner of that repo hasn’t been around in over a year now and it made it difficult to get things merged. Just last night we moved the dependencies to a new repostitory Mono-Game/MonoGame.Dependencies controlled by the MonoGame team. Because of how Git submodules work we had to move it from ThirdParty/Libs to ThirdParty/Dependencies. Also if any of your own projects referenced binaries in ThirdParty/Libs you will need to update those. Let us know how these changes affected you and how we can improve things moving forward.